I got this little surprise in my email this weekend. 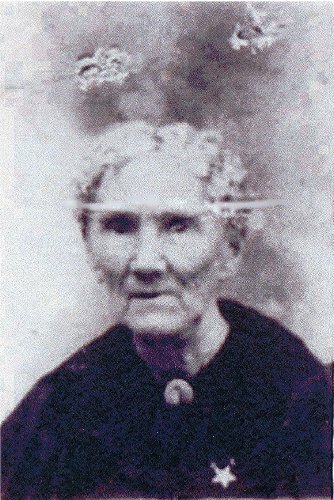 This is the only known photograph of Margaret Monroe Harris, my great-great-great-grandmother. Margaret Monroe was the wife of John Harris, and together they emigrated to the United States from Ireland. Ulster-Scots and Presbyterians, they soon settled into Ohio and then Indiana. John Harris was born in County Down, Ireland. He married Margaret Monroe (who was born in Belfast, Ireland) in the church of St. Nicholas, England. The marriage took place in 1847. They left for the United States on November 5, 1853. They settled in Portage County, Ohio, then in 1859 they moved to 3 1/2 miles south of Wanatah, Indiana. Death date of John Harris was about 1885. No record of his burial place. It is believed to be in Indiana. [It is since known to be in Westville, Indiana. -seh] Margaret Monroe Harris went to Nebraska in 1885. John and Margaret Harris were parents of 14 children, who were: Belle, Nancy Jane, George, Rachael, Colwell, Robert James, Horace Franklin, William Lincoln, Ella, Schyler, Maggie May. No record of three who died in infancy. Margaret Harris was killed in a tornado near Holmesville, Nebraska, on June 28, 1904 while she was visiting at the home of her son, Robert James. She is buried in the cemetery at Blue Springs, Nebraska, which is the oldest recorded cemetery in Nebraska. I received the above photo from a far-removed cousin in Oklahoma who found me on the Internet, probably through my blog. His data overlapped with my own data, so it is clear to me that this is the same Margaret Monroe that we both share--the Oklahoma relative is the son of my grandfather's aunt. I don't know what that makes me to him, but he's definitely kin. It's nice to see a little of our family history. This is very interesting!